A happy ending. 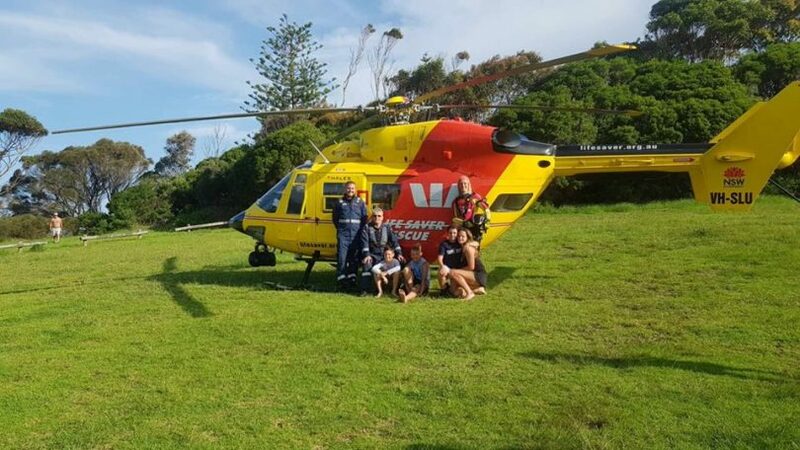 Two boys, and two girls from Victoria, rescued by the Westpac Rescue Helicopter Service near Bermagui’s Blue Pool. Photo: Westpac Rescue Helicopter Service. A summer scare for a bunch of Melbourne kids holidaying at Bermagui has ended well but under dramatic circumstances. Shortly before 5 pm yesterday (January 15), a young family were enjoying an afternoon playing on the rocks at Bermagui’s renowned Blue Pool when they became stranded by the turning tide. The children; two boys and two girls aged between 10 and 16 years, were about to head back when they realised their entry point had disappeared under rising waters. Suddenly, there was no way back to their mum who was waiting several hundred metres away. Eight members of the Bermagui Surf Life Saving Club call-out team swung into action, along with the Far South Coast Surf Life Saving Duty Officer, and lifeguards from the Australian Lifeguard Service who had been on patrol at Horseshoe Bay. An Inflatable Rescue Boat was launched in an effort to rescue the stranded children but the increasingly rough conditions quickly ruled that option out. Surf Life Saving NSW reports that conditions at the time were influenced by a strong northeasterly wind that was increasing the size of the swell. In the meantime, a member of the callout team scrambled down the cliff face to wait with the children while a decision was made on how to proceed. The call was made to winch the foursome out and back to safety with the Westpac Life Saver Rescue Helicopter out of Moruya. One hour after the drama started, the kids and mum were reunited on firmer ground. No one was harmed during the misadventure. We've had some video footage sent through to us by Emma from the #WestpacRescueHelicopter rescue off the rocks in Bermagui yesterday. Four children were winched to safety after they found themselves stranded at full tide. Our #LifeSavers were unable to reach them safely in the IRB due to the rough conditions and swell pushing into the rocks.Some fast action responses and great teamwork meant a good outcome for all. Thanks to #Lifesaver23 and everyone else involved! Far South Coast Duty Officer and Bermagui SLSC Secretary, Cheryl McCarthy says the successful operation was a joy to witness. “It was fantastic to see everyone’s training be put to the test in a real-life situation and the ALS Lifeguards, the crew from the Westpac Helicopter, and the call-out team certainly deserve credit for their professionalism and effort,” she says. The family involved have sung the praises of their rescuers and return to Victoria with a cracking tale to tell. Ms McCarthy says it’s been a busy summer in Bermagui, with the town full of holidaymakers enjoying the local environment. “This is the first rescue we’ve had this summer, people seem to be doing the right thing, swimming between the flags and listening to our advice,” she says. Don’t forget to be sun safe by remembering to slip on some protective clothing, slop on some sunscreen, slap on a hat, slide on a pair of sunglasses, seek shade, and sip on lots of water to stay hydrated.